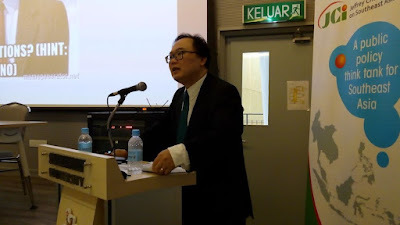 Professor James Chin delivers the lecture 'The Malaysian Federation: Views from East Malaysia", yesterday evening. – The Malaysian Insight pic, August 29, 2017. SARAWAK is expected to publicise oil concessions, having settled a legal question over ownership of a continental shelf off its shores, as soon as the general election is called, said a prominent political analyst. Professor James Chin, director at the Asia Institute at the University of Tasmania, was speaking on newly-formed state oil company Petroleum Sarawak Bhd (Petros), whose board members were announced by the state government last Friday. "Sarawak recently set up Petros because it is preparing for the day the federal government will recognise that the continental shelf belongs to Sarawak, so there's a commercial entity ready to take over immediately. "But the reason why all this is not announced because the election is not yet announced. Once the election is announced, all these concessions will be announced to the public," he said. Chin spoke at a lecture, "The Malaysian Federation: Views from East Malaysia", organised by the Jeffery Cheah Institute on Southeast Asia at Sunway University yesterday evening. On the recently publicised Sarawak-sponsored trip to London to obtain documents regarding the Malaysia Agreement 1963, Chin said it would yield little else aside from clarity on ownership of the continental shelf. "The important thing to remember is that the only legal document is the Malaysia Act. What they actually went to London for was to look at background papers. They were trying to understand the process of how all the reports were drafted. Who said what and all that sort of thing. "But legally speaking, the background papers have no meaning... What's important is the actual agreement signed. They're looking for the background papers and what they discovered was that; yes, there was a decision taken by the British government that says that the continental shelf belongs to the states of Sarawak and Sabah." Last year, the Bornean states each set up a technical committee on the devolution of authority. At the federal level, a parallel committee is headed by foreign minister Anifah Aman, brother of Sabah Chief Minister Musa Aman. "So the (technical committees) are actually a good start. But the thing is that they have yet to hold any public hearing and I feel that public hearings are very important to get the pulse of the people, what they think of this issue," Chin said. He added that there were three groups of people with varying opinions on autonomy in East Malaysia. "The first one is very simple to understand. It has got a huge Facebook presence. It's called Sabah Sarawak Keluar Malaysia. We are fed up, nothing is happening. No point to negotiations. Bye-bye. "The second group is the other polarity, which is we've not done too badly. It's a question of tweaking the Federation to get a better deal. "And of course, the third group are the fence sitters, who, depending on the issue, will fall either way. But there is also a unique political class in Sabah and Sarawak. The elites there. They've basically not changed since independence. They also, themselves, must come to a consensus. Chin said the political class should return to the 20- and 18-point agreements submitted by the Cobbold Commission to "maybe come to sort of a bare minimum... in terms of moving forward." He added that East Malaysians should not hope for constitutional amendments. "The federal government, or basically Umno, is not willing to make any constitutional changes. When they talk about devolution of power, they're talking administrative power given to the capitals of Kuching and Kota Kinabalu to decide. An example of that is the selection of teachers. "The federal government is willing to negotiate everything except secession. They do not actually mind passing back some of the powers. Because Umno is not in Sarawak and in Sabah, Umno is sort of in name only. They require the MPs from both sides in order to stay in power. So they're quite willing to negotiate. It doesn't cost them a lot, in terms of regulation and internal administrative matters, to push these powers back to Sabah and Sarawak," he said. Chin said autonomy is a highly "emotive issue" for East Malaysians. "But we should not allow history to hold us back. Although we should learn to understand the MSCC (Malaysia Solidarity Consultative Committee) process, the Cobbold Commission process, the IGC (Inter-Governmental Committee process report), they should actually be used as a historical starting point. But they should not be used as the final point to negotiate. "What Sabah and Sarawak would get largely would depend on the political consensus in the individual states of Sabah and Sarawak and only if they come to a clear agreement, like what Sarawak is doing now. A clear agreement, that they must assert themselves. They will get a better deal from Putrajaya," Chin said. Chin said East Malaysians seeking autonomy did not have the luxury of time. "A final point that I want to make is that the window of opportunity for Sabah and Sarawak to do something about the state of the Federation, as they understand it, is limited to five-year cycles. "In other words, in the next election, if Umno does very well on this side (Peninsular Malaysia) and it doesn't really need Sabah and Sarawak to stay in power, then they're back to square one. So the window of opportunity is actually very, very limited," he said. Chin added that Barisan Nasional will pick up "a minimum 31 to 32" seats out of a total of 57 seats in East Malaysia, including Labuan. "If they fall below that, please SMS me quickly," he said. – August 29, 2017.